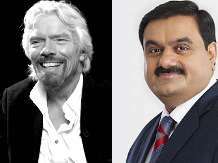 Virgin group promoter, now an environmental activist, Richard Branson is set to protest against Gautam Adani’s $15.5-billion (Rs 98,806-crore) coal mining project in Australia, saying mining in the area will damage the Great Barrier Reef. The last can only be described as breathtakingly beautiful and one of the wonders of the natural world. It is the largest collection of corals on earth (over 400 types), making up thousands of reefs of all shapes and sizes, alongside hundreds of exotic islands. This is the world's most-extensive stretch of coral reef and the only living thing visible from space. In a posting on his group’s site, Branson said the United Nations Educational, Scientific and Cultural Organization’s world heritage panel will meet in Bonn, Germany, in June, to decide if the reef be put on the world-heritage-in-danger list. “World heritage sites are special, and the responsibility for their protection is shared globally by all of us,” he said. “The massive industrialisation of the adjacent coastline for coal and gas ports is adding even more developmental pressures, including plans for dumping millions of tonnes of dredge waste into reef waters. I fail to understand how the Great Barrier Reef, a world heritage site, could be turned into an industrial dumping ground,” Branson said. He added that two activists from Ocean Elders, an ocean protection group, would be visiting the Australian site next month in a canoe to mark their protest. Branson, 64, set up Virgin Airlines, apart from founding 400 companies and has a net worth of $4.9 billion (Rs 31,228 crore), according to the Forbes magazine. Adani, 52, started with a small trading company in Ahmedabad and is now worth $7.1 billion (Rs 45,248 crore), according to Forbes. Adani has been in the news for his proximity to Prime Minister Narendra Modi and for his string of acquisitions in port and power projects after Modi assumed office last May. Adani did not respond to an e-mail sent on Thursday. The group will expand the port in Abbot Point, build a railway line to its mine, and develop the coal mine in Queensland. The project will be Australia’s biggest coal development project. Adani has invested $2 billion (Rs 12,746 crore) to buy the port. The project has been taken over by the promoters in their personal capacity after analysts raised questions about the high debt burden on Adani Ports. All the major American and European banks have refused funds to the project, citing environmental damage. In February, the Adani group said it was targeting financial closure for the project by the end of 2015 and after three years of construction commercial coal shipments could start by 2019. But with coal prices at a five-year low, the project’s opponents say mining in Australia and shipping coal to Asia will be unviable.